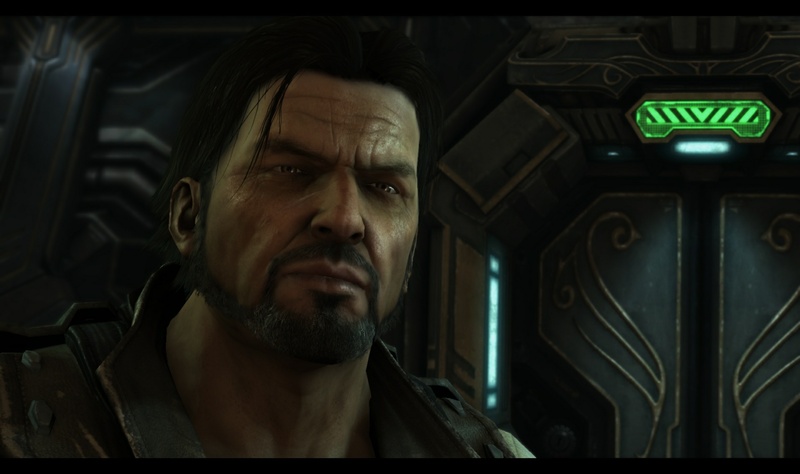 “Starcraft II: Legacy of the Void” is the perfect point of gameplay over story, which is a shame because this is a story that is trying to do a lot. The game it is most similar too is probably “Mass Effect 3” with Moebius Corp as Cerberus and Hybrids and Void entities as Reapers with an ending that isn’t really set up all that well and putting drama and rule of cool over character choices that actually make sense. The gameplay is top notch, like “Mass Effect 3” too. The one thing that puts it above “Mass Effect 3” for me though is that the character choices do make some level of sense in the end (the exception being the Epilogue) and that is where Blizzard showed themselves to be better storytellers than EA/Bioware in this instance. I’ll get into what I mean deeper into the review. The story picks up where we left off with Amon coming into the Universe. We first follow Zeratul who witnesses his rebirth and escapes to warn Executor Artanis who is about to begin the retaking of Aiur with the Golden Fleet. Things soon go awry when Amon takes control of the Khala forcing Artanis on the run as he must unite different Protoss factions against Amon’s forces and the Golden Fleet, Amon now controls. 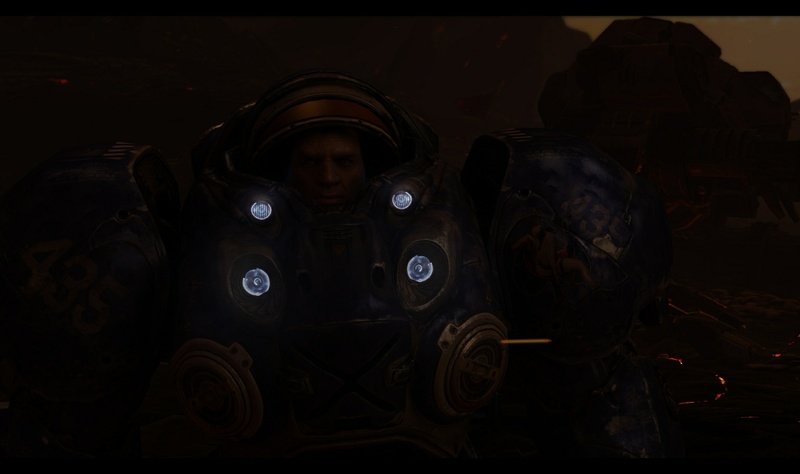 The Pros: The Universe – I love the universe of “Starcraft” and the main campaign does such an amazing job exploring it and giving so many more layers to the Protoss as a people. We meet more factions, see just how powerful Amon is and how insidious his influence is as well as see how difficult it is for a people to change as this is the game that at the core is about the Protoss changing as a species as the only way to defeat Amon is to make an Alliance between the remaining protoss factions and defeat Amon’s armies as well as making sure he never enters into the physical realm from void. The Transformation of the Protoss – The main arc of this game storywise is the Transformation of the Protoss. 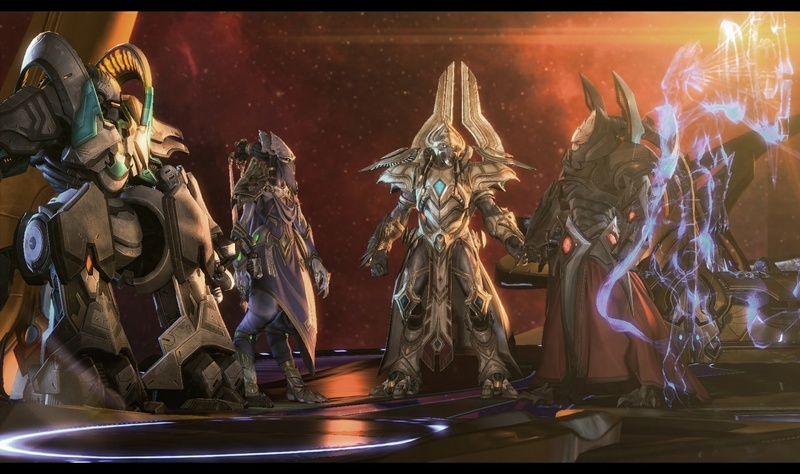 In this we see how the challenges to the Caste System and the Khala which began in the first game with the Dark Templar rejoining their Aiur breathren against the Zerg, and continues even further with a Preserver who advises Artanis and reacts negativly to all the Alliances he forms with the Nerazim (Protoss Sith Lords basically, Purifiers – AI Protoss and the Dark Templar). He constantly challenges her assumptions and shows it was the old ways that lead to the Overmind defeating them in the first place and that her holding onto the Khala is causing Amon to possess and destroy her. It is a great arc and we see them come together as one in the final fight against Amon before he can gain a body. 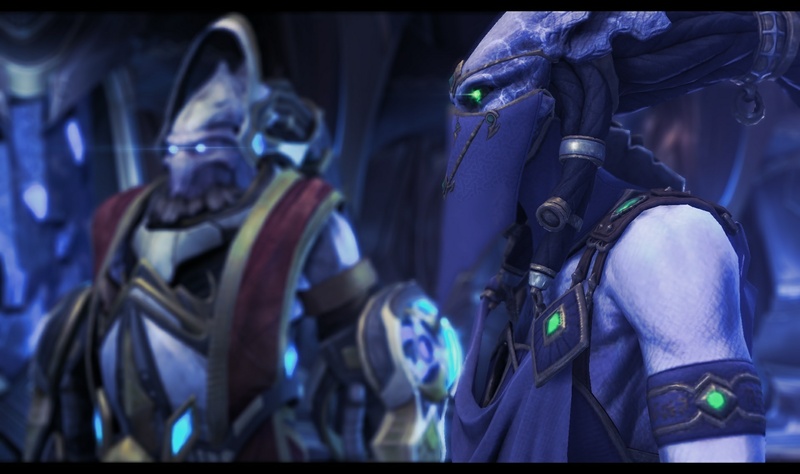 The Hero’s Journey of Artanis – The main journey is that of Artanis as he steps up to the mantel of leadership and must face his insecurities and guilt, as when Amon possess him he kills Zeratul before Zeratul can free him, and this is after Zeratul warned him that Aiur had already fallen to Amon and that he was going into a trap. 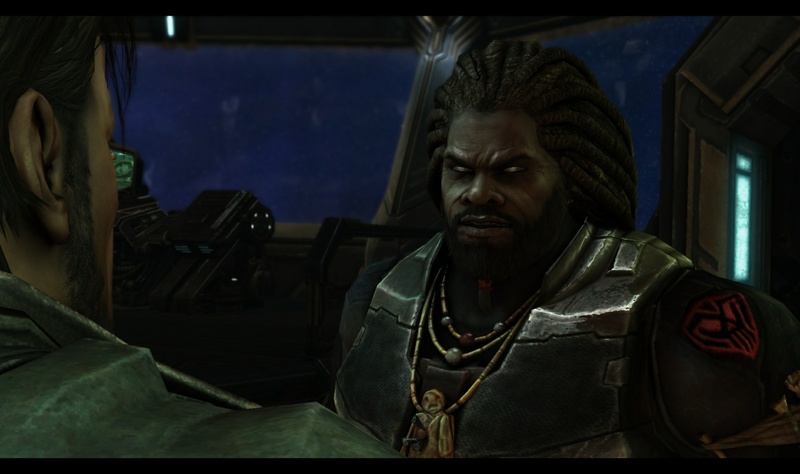 He carries this forward and does everything can can to broker peace among the Protoss factions and within himself and new allies challenge him to become a better leader and introduce him to new perspectives that he integrates through the course of the story. John De Lancie’s Alarak – Alarak is part of Tal’darim, the enemy Protoss introduced in “Wings of Liberty” who worship Amon and are apocalyptic in their aims. They are essentially Protoss Sith as their philosophy is based on dominance and strength and they care for nothing but the individual. Alarak is a shining example of this as he only joins with Artanis when he realizes that Amon will destroy them when his intentions are revealed so he goes to take control of the Tal’darim and bring the war to Amon. He is a hilarious character who has so much sass. Anyone he talks to, he shuts down and in the end he goes his own way as well, refusing to rebuild on Aiur and rejoin his people. He’s a punk who is powerful and fun and really shows just how diverse the Protoss are in mindset. The Protoss Factions – There are the Purifiers who are A.I. 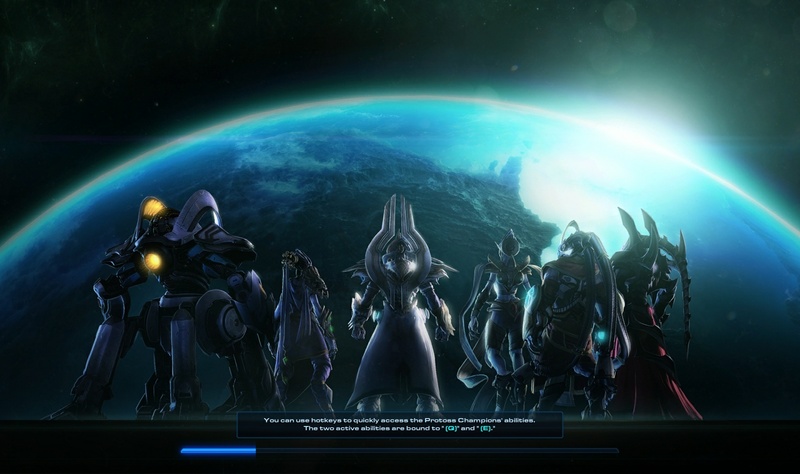 who gained sentience and rebelled and must trust their organic counterparts again (and one hold Fenix’s memories), the Dark Templar lead by Voruzan (who really should have gotten more development in this game), the Preserver of the Spear of Adun who holds onto the old ways and history, a Phase-Smith who becomes a hero and Templar rising in his caste and Alarak, the sassy Tal’darim who is in an Alliance of convenience with our heroes. I loved clicking them and getting their perspectives in the different scenes. 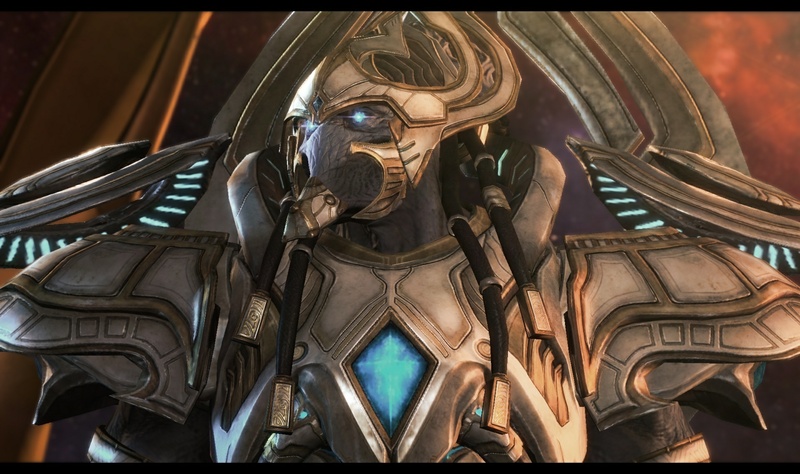 Each showed just how layered and complex the Protoss are a species. Unit Choices in Battle – As you recruit different factions you can choose what units you can bring into battle. Tal’darim have damage based unit types, Aiur Protoss are about shields, Purifiers are strong units and the Dark Templar are the infiltrators. Depending on the mission different units will serve you better. This was a lot of fun and gave a different dynamic to how to go about completing missions. 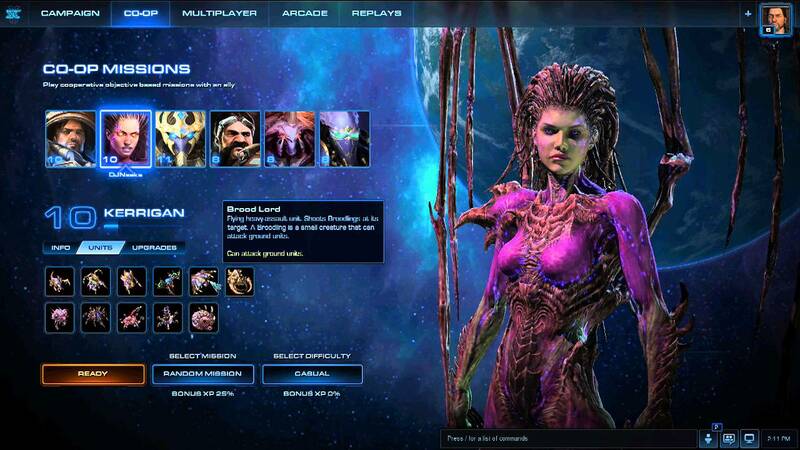 Mission Variety – This game has the best mission variety out of all the different Starcraft IIs. Whether it was defending resources and moving to different gather points on a moving metal disk, stopping a base from crashing into the Dominion homeworld and having to repair and defend it, a countdown to prevent Amon from getting his body and countless others. All of them were a lot of fun and felt epic in scale. The Cons: Rule of Cool – One of the annoying things about this game was how often it went to “Rule of Cool,” like “Mass Effect 3” did on countless occasions when ever Cerberus was involved. The best example of this are the times that Artanis goes in alone. He is leading his entire species and he refuses to let anyone come with him. I get the Protoss are honor bound but the entire Universe is at stake. This is how the Rule of Cool can become the Rule of Stupid. To create a cool looking fight characters will do stupid things to bring about impossible battles and due to plot armor will win. I hate that type of garbage storytelling and a few of the cutscenes were just that. The Epilogue – The epilogue is a lot of fun to play, you get to play with the Protoss, Terran and Zerg armies. First with the Protoss as you fight Narud in the Void, second the Terran as you defend Kerrigan turning into a Xel’Naga and finally as the the Zerg and Kerrigan where you break down Amon’s defenses so that Kerrigan can kill him. It is gameplay over story as there is one missing Xel’Naga who was trapped for some reason and turns Kerrigan into a Xel’Naga / God. It is so silly. The only things I liked about it was the combat and the fact that Kerrigan saw it as a way to atone for her sins as the Queen of Blades. This is the only way it worked, and I did like the afterword that Zagara as the Overqueen leading the new Swarm. Still was mostly stupid, the fight against Amon should have been the main mission given how dangerous he is. Making it an epilogue made the story that they set up in Wings of Liberty feel rushed and poorly thought out. “Legacy of the Void,” for all of the flaws it has is well worth your time. Gameplaywise it is the best of the Trilogy and storywise has the main flaws that littered the entire Trilogy with rushed setups and failure to have payoffs. They did kill off Zeratul which for me puts it above “Wings of Liberty” in story though. 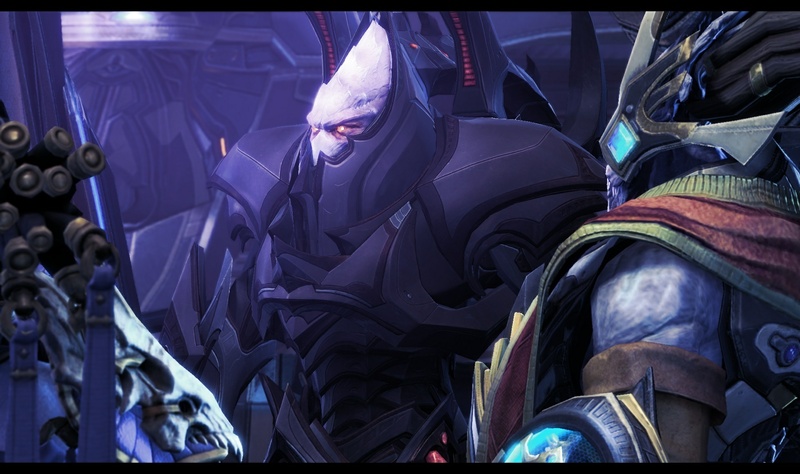 This story did take risks, and the overall theme of uniting the Protoss in the main campaign was fantastic. In the end I’d rate it slightly below “Heart of the Swarm” but above “Wings of Liberty.” The Epilogue hurts the final score the most as does Rule of Cool but it is still a game that I can’t help but recommend. I haven’t played the Nova DLC but if I do that will be a future review. For now, Blizzard had a good end to their series, even if it failed to reach greatness in the final chapter/Epilogue.